Lee and Geri Carpenter’s 1957 Packard Clipper Has VAE club history at its best. 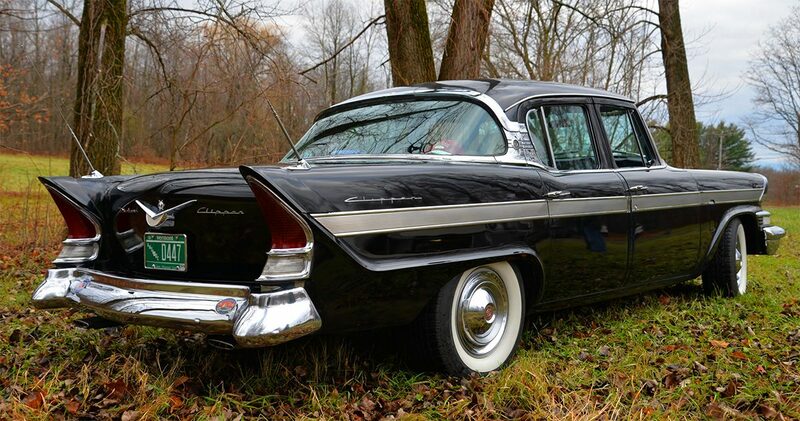 This 1957 Packard Clipper was originally owned by the parents of one of the VAE’s founding members. Peveril Peake. We are the second family owner having bought it from Pev in 2004. 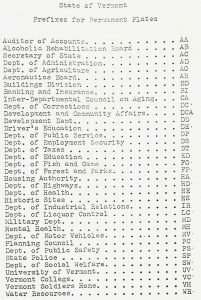 This was Pev’s mother’s car, purchased new from Archie Myer’s Studebaker in Winooski, Vt. on January 2, 1957 ( from the original bill of sale ). The fly swatter hanging on the heater dash knob was the dealership’s free gift with purchase! This car was rarely out in the rain, never in the winter and never slept under the stars. Peveril began calling it ” Princess”. 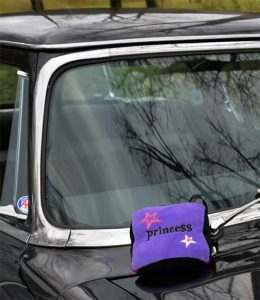 When we acquired it in August of 2004, our daughter was then 9 years old and she donated her “purple ” Princess” pillow, to the car. And it has lived in the back window since! Lee grew up in the same town as the Peakes in Bristol, Vermont. He and Pev were friends and had many adventures together. When Packard and Studebaker announced there were to be no further productions of this car Peveril purchased a used one exactly like this one, for a parts car. In 1968, Lee, at 16 , bought that parts car as his first car under the condition that it be returned to Pev when Lee was finished with it, in whatever shape it was in. Lee drove it until the transmission and super charger died. We now have, from that car, a spare dash, trunk lid, four doors, and all the glass from it stored in the garage attic ! Peveril saved many things including the original bill of sale and registration. 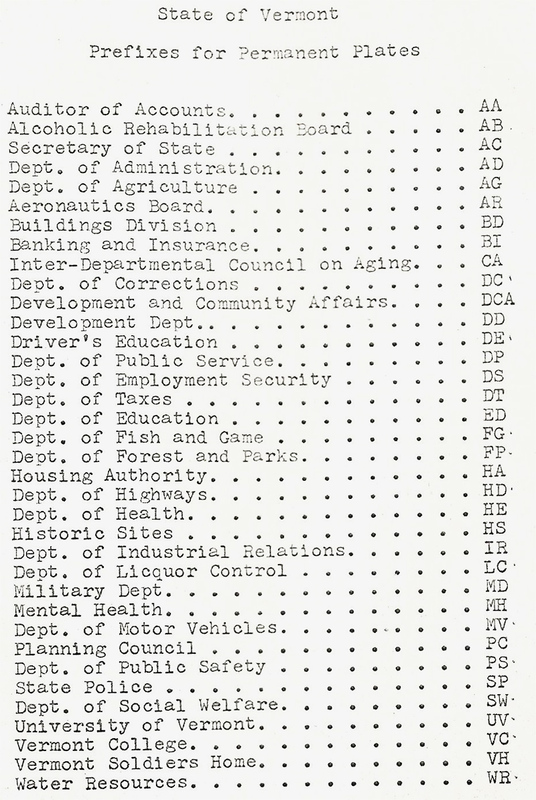 At every registration renewal he would document the mileage of the car. He also saved the owner’s manual ,shop manuals and accessories booklet. In 1969 Peveril and Lee, along with two others, drove this car out to South Bend, Indiana to the home of Studebaker for the Second International Meet. The judges were about to deduct points for the windshield wipers and spare tire, until Pev pointed out they were the originals! There it was awarded second place. That same spare is in our trunk today. It remains in all original, unrestored condition. The engine has 121,000 miles on it, not rebuilt. The paint, trim, carpets, headliner and upholstery are also original . 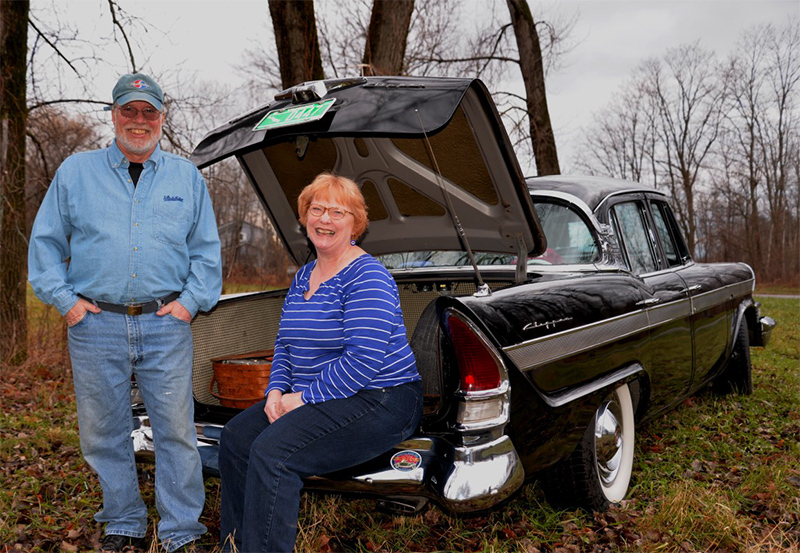 It has been in the VAE’s Stowe Car show every year since 2004, and in the Senior Class since 2013. It has chauffeured a number of brides and grooms, including the Carpenter family and Gale and Judy Boardman and their daughter, then our son’s first prom. It was invited to be a part of the Hemmings Motor News’ Concours D’Elegance, twice. ( 2010 and 2015 ) As well as being a feature in their Classic Car ( Feb 2010 ) magazine. 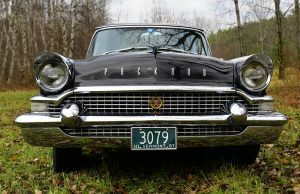 It has been awarded first place in the Studebaker International meets of 2007, 2008, 2014, 2016 as well as first place in other Studebaker zone meets. 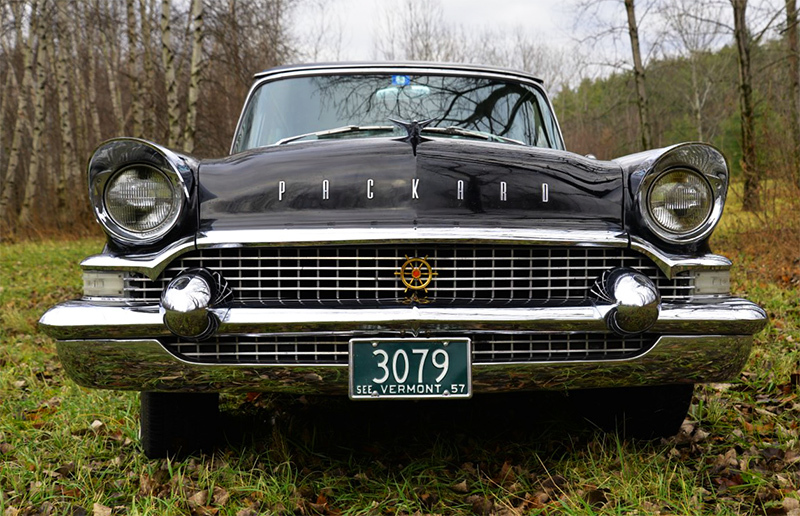 To quote Peveril Peak , the original owner of our Packard ( and one of the founding members of the VAE) this was a trip that was “fraught with danger and emotion” We didn’t get started on time as planned. Leaving a day late due to rain, we couldn’t even make it out of the garage! The Packard’s battery was dead, so we made a quick trip to Interstate Battery, for a new one. Lee opted to not take the bright lime green one they brought out to the counter, and asked for one in black. Twelve miles from home the left front hub cap popped off while going around the clover leaf highway! I quickly watched where it rolled along the edge of the road. It was on an overpass and could have gone through the guard rails down onto Interstate 89 but didn’t. This was a blessing in disguise as I picked up an 18″ bungee cord along with the hub cap ( which was undamaged). This bungee cord came in handy later in the trip. About ten miles down the road we got stuck in Route 7 construction. In the rain and mud the car got plastered and appeared like a two toned painted car. Black on top, brown on the lower half. Covered with mud. Our trip went uneventful thereafter except for the geese around Syracuse, NY. While passing a Wildlife Preserve, two Canada geese, decided a good place to land was in the middle of our lane on the highway! With only a couple of car lengths of road ahead of us Lee honked the horn, which they ignored. He then had to swerve quickly to avoid hitting them! We could imagine the dented grill if we were not able to swerve around them. They stood a good 2 1/2 feet tall! When we were 20 miles from South Bend we hit stop and go construction traffic which took us an hour to get through. Then, 890 miles from home we arrived at our hotel. The next day, in the rain, we headed for the host hotel. We gassed up about one block from our hotel and at the very next stop light the car started spewing steam !!! It was raining and about 45 degrees. We pulled under the next hotel’s canopy and to our good fortune, it was the host hotel of the Avanti Club! Almost immediately people came out to help! Lee opened the hood and found anti-freeze spitting all over the engine compartment. Once the steam cleared Lee found the radiator cap had loosened. We added about a gallon of water and we were on our way……. ooops but the hood wouldn’t latch ! Here’s where that bungee cord came in to good use. We registered at the event hotel and made our way, in the rain, to the fairgrounds where the judging was taking place in the swine barn. The wait was quite long even though three judging lines had been set up. The delay was because the ‘trailered’ car owners were unloading in the judging barn instead of outside, and taking up a lot of time and space. Once inside the long barn we did have time to wipe the car down and replace the hub cap. They said they would not deduct points for the rain. Our poor engine compartment had antifreeze splattered all over it. They took quite a while looking over the car, we were there for an hour and a half. Thursday evening was the member’s meeting/buffet. It was down-right awful! 500 people were seated with three food stations. Nachos, a potato bar (yes, a potato bar where they put a scoop of mashed potatoes in a martini glass and you added your toppings) and lastly the slowest pasta serving bar in the country. They individually heated up our chosen sauce in an omelet pan, then added the pasta. A very slow process. And NO desserts! The Studebaker band played loudly throughout the whole dinner. We could hardly speak with others at the table. We did not stay for the evening auction. Friday we woke to a beautiful day. Sunny and dry, but cold and windy. We headed for the museum. The parade was at 3 pm and it was poorly organized, not marked and there was no one directing traffic. Once finally downtown, it was a very nice event. There was a great turnout of cars and people. All of downtown had been cleared out and it was curb to curb Studebakers for about 4 blocks! The Studebaker band played again over a PA system. Saturday was another bright sunny cold windy day. We arrived on time at the Proving Grounds and sat around the tarmac waiting an hour and a half. We were grouped with 14 cars in each pack. We had 2 laps around the 3 mile banked cornered track. We made it up to 70 MPH. This was fun, and I dare say, it made Lee’s day. Then on to the fairgrounds where they had reserved the front three rows of the field for those of us who were at the Proving Grounds. This was a nice gesture and well appreciated as we arrived later in the morning. Throughout the show there was the huge projector showing old Studebaker TV ads from the 1950s. This was cool and entertaining. 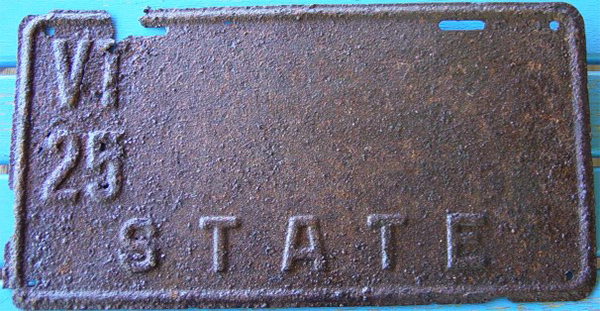 (I believe they are available for purchase at the Studebaker Museum.) During the awards presentation the winner’s pic-tures were up on the screen with their name and points. We were award-ed a second place plaque. Perhaps the splattered antifreeze deducted points from our score! 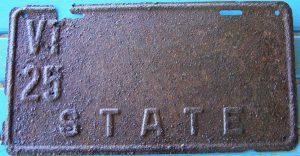 We checked off a list of state license plates and counted 29 different states with a Studebaker plate!!! As well as 2 Canadian Provinces. Our traveling adventures were not over, as we had not yet parked in our own driveway. Coming home, as we were getting on I87 North we rounded a cloverleaf entrance ramp and TWANG!!! That same left front hub cap went flying across the 3 lane highway, across the median, into the next three lanes. A car had to brake, but got around it, then the car in the next lane…. Ka-thunk. Damn. Good thing our spare tire has a matching hub cap! So, if anyone doesn’t believe their car has a personality, think again. We think that Princess (the Packard came pre-named) did not want to go on this trip and showed us!!! Author john sandvilPosted on January 2018 January 2018 Categories Dave's Garage, Wheel TracksLeave a comment on What does “FG” Mean? As the time is getting close, I will first wish one and all a Happy New Year. It is a bit hard to believe it will be 2018 (if you are reading this, it is 2018!) It seems like yesterday that we were all trying to decide how to say the years in the 2000s, should we say 20-01 or 2,001 and now we are 18 years later! Now that the introduction is out of the way, on to the subject; New Year’s Resolutions. I did some research (on the internet) so you can agree or disagree but isn’t everything on the internet on the up and up? New Year’s resolutions started with the Babylonians over 4000 years ago. They started off each new year with the resolve to change something for the better. Previously, it was usually something for someone else like pay off a debt or return a borrowed item. The Romans made prayers to their god Janus, for whom the month of January is named. 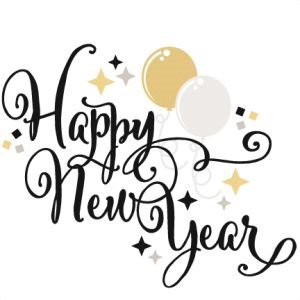 Other groups made resolutions through the years, and for the most part the present-day resolutions, have gone from trying to help or improve life for others to self-improvement. The most popular goals include improve your physical well-being; eat healthy, lose weight, exercise (more), drink less (alcohol), quit smoking, get rid of old unhealthy habits. Other thoughts are laugh more, enjoy life, reduce stress, improve finances, get a better job or do better at the current one, volunteer, settle down, spend more time with family, go to church. The list can go on and on and I really commend those who take the plunge and can manage to reach their goal and stick with it, but the internet tells me that less than 8% achieve their goals. Which now brings up the question of why can’t we seem to keep our resolutions and reach our goal, after all, whatever we have chosen to ‘improve’ without much doubt needs improvement or we wouldn’t have chosen it. I have given this much thought and guess what? The internet backs me up! We tend to set goals that are too hard, complicated or just plain too big, like lose 100 pounds, get a job that pays 4 times what I’m earning now, which probably would require more education, moving, etc., all of which I am not willing to do. You get the idea. We might have more success if we said lose 4 pounds a month and plan how to accomplish this, i.e. ; walk, skip one restaurant meal a week, shop in the produce aisle for half of my groceries. Is there a light dawning? For most of us, we need to start small and build on that. Another thought I have is going back to what was the original purpose for New Year’s resolutions; make someone else’s life better, return the shovel to your neighbor or give your parents back the money they laid out for your education. Now that would sure brighten my New Year!! I am sure you could make someone’s life better with just a friendly smile and a hug. Realizing the world we live in today, how about a smile and a wave or handshake. I am sure the Milton road crew’s life is made better every time Mary shows up with cookies! Probably their wish is that Mary’s New Year’s Resolution is to set a goal of a dozen or 2 cookies twice a month!